I'm always looking for ways to use ripe bananas. How about you? 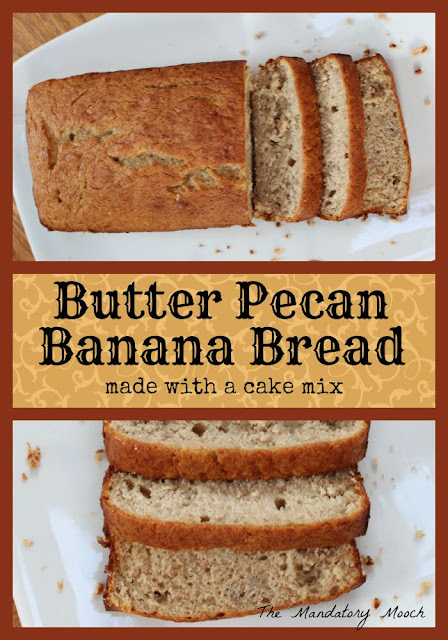 My girls love to have fresh banana bread for breakfast or a snack. Being a working mom, I don't have time to spend hours in the kitchen. This recipe is simple and tasty. You will keep this one on hand for the next time those bananas are sitting on the counter needing to be used. Mash the bananas, mix in butter. Add cake mix and eggs, stir until well blended. Pour into greased loaf pans. Bake at 350 degrees for 45 - 55 minutes, or until a toothpick inserted into the middle comes out clean. Let cool completely. Removed from pan, slice, and serve. Love the simplicity of the ingredients and bet it tastes amazing! Thanks for joining the Thursday Favorite Things Blog Hop! Thanks for sharing at Snickerdoodle Sunday. This bread looks delicious. I love that it starts with a mix. Pinned and Tweeted. I've never thought of making banana bread with a cake mix. Looks good. Thanks for sharing at the Inspiration Spotlight party. Pinned & shared.